Daisy is the common name for a large number of dicotyledonous flowering plants within the Asteraceae (or Composite) family, and in particular is associated with the true, common, or English daisy (Bellis perennis) and the oxeye daisy (Leucanthemum vulgare, sny. Chrysanthemum leucanthemum). Daisies are characterized by the star-shaped flower head, consisting of a densely packed cluster of numerous, small, individual flowers (florets). Both of these species have a center composed of yellow disc florets surrounded by ray florets with long, white petals. In addition, the entire family sometimes is known as the daisy family. The beauty of the flower head of daisies has made them a favorite of many people and a popular name of girls. They also provide food for pollinating insects, herbivorous insects, and even people consume their leaves. 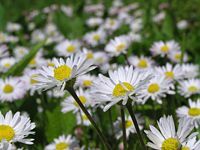 However, the introduction of the English daisy and oxeye daisy to non-native environments also has led to their being considered invasive species, which can be difficult to control or eradicate. 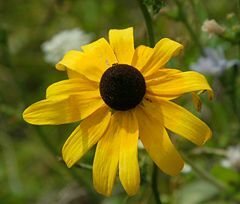 Yellow daisy (Rudbeckia hirta), also known as black-eyed Susan, has yellow ray florets circling a brown, domed center of disc florets. The daisy family, also known as the aster or sunflower family, is classified variously as Asteraceae or Compositae. The name "Asteraceae" is derived from the type genus Aster and refers to the star-shaped flower head of its members, epitomized well by the English or true daisy, Bellis perennis. "Compositae," an older but still valid name (McNeill et al. 2006), means "composite" and refers to the unique inflorescence (described below). The daisy family is the the largest family of flowering plants in terms of number of species. According to the Royal Botanical Gardens of Kew, the family comprises more than 1,600 genera and 23,000 species. These are dicotyledonous flowering plants. In addition to the daisy, other well-known members of the family include lettuce, chicory, globe artichoke, safflower, dandelion, chrysanthemum, ragwort, and sunflower. In the essential oils Sesquiterpenes are present, but iridoids are lacking. The most common characteristic of all these plants is an inflorescence or "flower head:" A densely packed cluster of numerous, small, individual flowers, usually called "florets" (meaning "small flowers"). Daisies typically have two kinds of florets. The outer perimeter of a flower head, like that of the English daisy and the oxeye daisy, is composed of florets possessing a long strap-like petal, termed a ligule; these are the ray florets. The inner portion of the flower head (or disc) is composed of small flowers with tubular corollas; these are the disc florets. 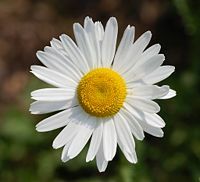 It is thought that the name "daisy" is a corruption of "day's eye," because the whole head of the common daisy closes at night and opens in the morning. Chaucer called it "eye of the day." The name daisy is associated with a very large number of flowers within Asteraceae, spanning a wide number of genera. The following is only a partial listing. Bellis perennis is a common European species of daisy, often considered the archetypal species of that name. Since related plants also share the name "daisy," the name of this species is sometimes qualified as common daisy, English daisy, true daisy, or lawn daisy. It is native to western, central and northern Europe. The species is widely naturalized in North America, where it is considered an invasive weed. The common daisy is a herbaceous plant with short creeping rhizomes and small rounded or spoon-shaped evergreen leaves two to five centimeters long. It grows close to ground. The flower heads are two to three centimeters in diameter, with white ray florets (often tipped red) and yellow disc florets. These flowerheads are produced on leafless stems two to ten centimeters (rarely 15 centimeters) tall. 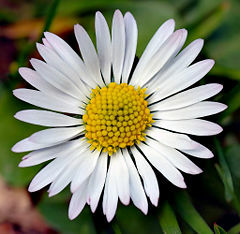 The common daisy is not affected by mowing, regrowing quickly, and is therefore often considered a weed on lawns, though many also value the appearance of the flowers. The common daisy has a number of uses. Several cultivars and hybrids have been selected for aesthetic purposes with much larger flower heads, up to five to six centimeters diameter and with light pink to purple-red ray florets. Bellis perennis has astringent properties and has been used in folk medicine as well (Howard 1987). The green leaves are edible and can be part of culinary dishes, but should be consumed moderately. Leucanthemum vulgare (synonym Chrysanthemum leucanthemum), known as the oxeye daisy, marguerite, moon daisy, or dog daisy, is a widespread flowering plant native to Europe and the temperate regions of Asia. Just one of a number of plants to be called by the common name daisy, the oxeye daisy is is a perennial prostrate herb with a small flower head (not larger than 5 centimeters) that consists of about 20 white ray florets and numerous yellow disc florets, growing on the end of the stem. The stem is mostly unbranched and sprouts laterally from a creeping rootstock. The leaves are darkgreen on both sides. The basal and middle leaves are petiolate, obovate to spoon-shaped, and serrate to dentate. The upper leaves are shorter, sessile and borne along the stem. The oxeye daisy produces an abundant number of flat seeds without pappus. It spreads also vegetatively by rooting underground stems. The oxeye daisy is a typical meadow flower, growing in a variety of plant communities such as dry fields, meadows, but also under scrubs, open-canopy forests, and waste places. It thrives in a wide range of conditions and prefers heavy and damp soils. The oxeye daisy was introduced in parts of North America, Australia, and New Zealand, where it is now a common weed displacing native plant species in some areas. It is difficult to control or eradicate, since a new plant can regenerate from rhizome fragments. However, in North Carolina it is planted on roadsides by the highway department (Barringer 2007). Barringer, F. 2007. Wildflowers find favor with highway gardeners. New York Times August 29, 2007. Howard, M. 1987. Traditional Folk Remedies: A Comprehensive Herbal. London: Century. ISBN 0712617310. Judd, W. S., C. S. Campbell, E. A. Kellogg, and P. F. Stevens. 1999. Plant Systematics: A Phylogenetic Approach. Sunderland, MA: Sinauer Associates. ISBN 0878934049. McNeill, J., F. R. Barrie, H. M. Burdet, et al. 2006. International Code of Botanical Nomenclature. International Association of Plant Taxonomy (IAPT). Retrieved November 17, 2008. This page was last modified on 21 November 2008, at 15:20.